Amika started #FreePeriods in April 2017 when she was 17. Her aim is to eradicate period poverty in the UK and globally, so no child misses out on an education because of their period. A big day in the fight against period poverty, but our work is not done! One year ago, in December 2017, I stood outside Downing Street with 2,000 young people, to protest period poverty in the UK. We called on the government to tackle the issue by providing free menstrual products in schools. Despite horrific reports in the media that 1 in 10 girls have struggled to afford pads and tampons, and many have missed school for a week every month, or even gone to school using toilet paper, newspaper, or old clothes instead, we are yet to see any meaningful policy change. 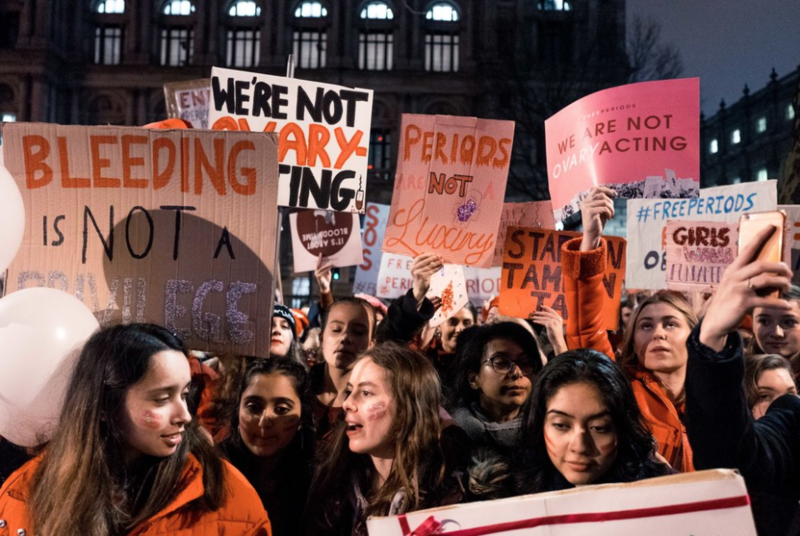 The Scottish government has made history by ensuring free access to menstrual products in all schools, colleges and universities. The Welsh government pledged £1m to address period poverty. In England, we are being left behind. Together with the Red Box Project and with the support of The Pink Protest, #FreePeriods is launching a campaign to shout out about this silent barrier to achieving full equality. Equal access to education is a fundamental human right and no one should miss school because they cannot afford pads and tampons. These products must be provided for free in every school and college. We are calling on the government to take action to ensure that EVERY schoolchild has access to the menstrual products they need. We need funds to push forward this next phase and ensure that we present a robust legal case, so that not one child misses school because of their period. Funds will be used for exploratory legal work and in support of the broader legal campaign. Free Periods is being advised by the human rights team at Law firm Hausfeld & Co. Periods should not hold us back. Please join us by supporting and funding our campaign. Follow our Instagram and Twitter, and visit www.freeperiods.org for more information on the campaign and to find out how you can get involved. We are Free Periods. Our aim is to ensure that every young person in the UK has access to free, universally available menstrual products in their schools and colleges, and that this is funded by the UK government. Amika founded #FreePeriods when she was 17. Now 19 and at university, she has received global recognition for her campaigning work, including receiving a Goalkeepers award by Bill & Melinda Gates, in conjunction with the United Nations, and was recently listed by TIME magazine as one of the 25 most influential teenagers in the world. The Pink Protest is a community of feminist activists committed to engaging in action and supporting each other. Founded by Scarlett Curtis, Grace Campbell, Alice Skinner and Honey Ross, they organise events and campaigns allowing young people to get involved with real, grassroots activism. The Red Box Project is a national community project working to provide free access to period products in local schools. The Red Box Project has over 200 projects run by volunteer coordinators across the UK and is committed to supporting young people to access period products until the government steps in. Chairwoman and co-founder of Halebury, a pioneering NewLaw firm, and advisory board member of Equality Now. Free Periods Limited is a company limited by guarantee, with the registered address of 1st Floor, Kirkland House, 11-15 Peterborough Road, Harrow, Middlesex, United Kingdom, HA1 2AX. te lo queria dar desde que ganamos pero te quiero eres una chingona. Well done for raising this issue and doing something positive about it. Good Luck and keep pushing. Today, Philip Hammond has announced that the Government will fund free menstrual products in all secondary schools and colleges in England. We think this is a hugely important and significant pledge, and a testament to the hard work and dedication of activists, grassroots campaigners and their supporters, like you! However, our work is not done. Although we are glad to see the Government at last taking responsibility for this issue, we at #FreePeriods urge the Chancellor to do more. The policy announced today would cover only secondary schools and colleges, leaving thousands of children behind. For example, there can be no good reason to exclude children at primary school, who may begin menstruating from as young as 8 or 9, from the scope of this scheme. We also need to ensure that this scheme is enshrined in legislation, with a long-term, sustainable and ring-fenced funding commitment. Given the limited scope of today’s announcement, therefore, the #FreePeriods legal campaign remains ongoing - and we are ready to hold the Government to account. please do continue to share this page and donate if you can! Thank you so much for all of your donations so far - we have been blown away by the contributions made in the first 30 days of our campaign. But we are only just getting started! We need your support more than ever to continue to develop our national campaign. We are thrilled to have appointed Schona Jolley QC and Claire McCann of Cloisters to act as our barristers to assist with the legal case and we are all working hard on the next stage of the legal process. With your backing, we believe we can change the status quo and compel the Government to comply with its legal obligations to provide free menstrual products in ALL schools and colleges. Sharing the FREE PERIODS FILM, POSTERS and mission. Do you have five new people you could introduce to the #FreePeriods movement by Whatsapp or email? Could you post on your social media? “I am part of the #FreePeriods movement and I’m calling for an end to period poverty. We need free menstrual products in ALL schools. Help us fund our legal campaign to make this happen: https://www.crowdjustice.com/case/freeperiods"
If you haven’t already, please do follow our Instagram and Twitter, and visit www.freeperiods.org for more information on the campaign and to find out how you can get involved. Thanks again for your incredible support. We can really feel momentum building. Please help us to keep it up! Together we can make a real change.